These reviews comprise part of a challenge undertaken with Simon from The Blether. There are definite benefits to a diverse longlist. One of these is the chance for me, as a reader, to immerse myself in the world of another culture completely different to mine, as I got a chance to do this week when I devoured Five Star Billionaire by Tash Aw, possibly the best author I had never heard of. I think it’s really easy to assume that because we’re talking about books in English, the longlist is going to consist of Americans, English people, Australians, Canadians and even New Zealanders. But the extent of the prize reaches much further. This is demonstrated by a varied longlist that includes (as well as lots of Irishmen), a Nigerian novelist, a Japanese Buddhist monk, and Tash Aw, who was born in Taipei and raised in Malaysia. He now lives in London. His grasp of the English language is superb for someone to whom it is not a first language; lyrical, rich in concrete imagery and almost poetic particularly when describing moments of tragedy or disappointment. 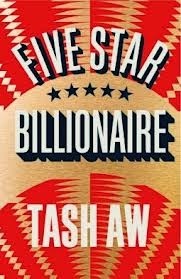 Five Star Billionaire is a work which is funny, subtle and rich with characters who grow and breathe on the page as you read them. The novel follows five characters all living in Shanghai around the same time. Phoebe is an illegal immigrant to mainland China who wants desperately to climb the executive ladder so that she might be something. She is presented with the opportunity to adopt someone else’s identity, and becomes adept at lying, until it becomes difficult for her to discern the lies from the truth. Then there is Justin, the oldest son of a successful Malaysian property developer who walks away from the life that he knows and tries to live as a simple man. He discovers it is not that easy being normal after all. He is summed up perfectly by one line: “The event organiser sent him copies of the photos- he was frowning in every one.” Yinghui is a very modern woman for China at this time, but at the same time she is very traditional, choosing to keep her Chinese name rather than adopting a trendy Western one. Spurred on by her heartbreak (the story of which makes it much easier to like her) and past failure as a cafe owner, Yinghui has risen to be a successful business owner, and is invited to take part in an exciting project with a mysterious billionaire investor. Gary is a popstar who rose to meteoric fame after winning an Australian Idol style reality show, impressing the crowds with his innocence and beauty. He grows sick of fame and has a sort of public breakdown that sees him reduced to performing at Red Rooster openings. Finally, there is Walter Chao, the eponymous Five Star Billionaire himself, raised from humble roots and narrating the frame story of this novel as if he were dictating a self help book for others who want to follow in his footsteps. Each of these characters is linked in some way. Their stories overlap in quite beautiful ways; each one seeming to miss an opportunity to get what he or she wants from one of the others. All except for Walter. It is him who seems to be pulling the strings. He hires Yinghui and she begins to fall in love with him. He dates Phoebe and she becomes dependent on his money. He hires Gary to perform at a concert, putting his career back on track. Only to Justin does his link seem tenuous, grounded as it is in the confusing descriptions of business transactions. I think these are supposed to be deliberately obfuscating however... Justin and Walter parallel each other, one being the more honest but less successful, and other being rich, but not what he seems. The truth about Walter is never confirmed, but very slowly begins to become apparent to the discerning reader. He seems to be playing them all; he convinces Yinghui to get a bank loan, and the banker has never heard of him. Phoebe sees the self help books on how to get rich on the floor in his apartment, which has very little furniture. He is telling us the story of his rise to fame, supposedly, but really he is telling us of his sordid, poverty stricken adolescence, essentially providing us with a clear understanding of the determination never to be poor again. All of Aw’s characters are compelling and authentic, embarking on journeys of self awareness in a city that is just not big enough for everyone to make their dreams come true. The plot is modern without being cheesy, encompassing social media and online dating convincingly at the same time as including counterfeit handbags, reality television, iPhones and all the other modern accoutrements that now go hand in hand with ideas of success. This is not a rags to riches story. This is a riches to rags story in many ways. Will it be the novel to take out the prize? Well no, because at the time of writing this, it has already been revealed that this title did not make the short list. But I sure am glad I read it.